The filing alleges that baseball officials bought testimonies ‘to destroy the reputation and career’ of A Rod. 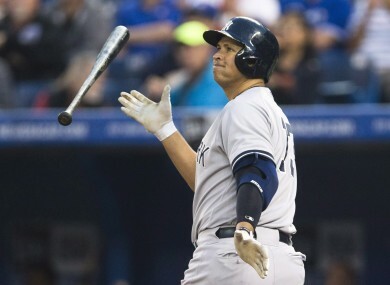 Alex Rodriguez reacts to striking out against the Toronto Blue Jays. NEW YORK YANKEES star Alex Rodriguez has filed a lawsuit against Major League Baseball for allegedly buying the testimony of a key witness in the doping case built against him. ‘A-Rod’ did not name the Yankees in the 31-page lawsuit, which seeks damages that would be determined at trial. Email “Yankees star Alex Rodriguez sues MLB over doping probe”. Feedback on “Yankees star Alex Rodriguez sues MLB over doping probe”.